Sleep apnea is a medical problem with a dental solution. At Almadensmiles, we take sleep apnea very seriously as it can potentially be a life threatening sleep disorder. 1. 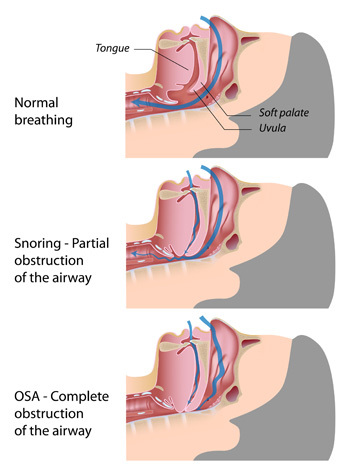 Central Sleep Apnea (CSA) – This rarer form of sleep apnea occurs when the brain fails to send important signals to the muscles used while breathing. In this form of sleep apnea, it is not that the person cannot breathe, but rather that the brain is not telling the body to breathe. Although dentists are able to help those who have been diagnosed with sleep apnea, it is a medical problem that needs to be diagnosed and monitored by a medical professional. Traditional treatment for sleep apnea is a CPAP machine. A CPAP machine is prescribed by a medical doctor and applies positive airway pressure to open up airways while sleeping. Many patients complain, however, that the CPAP is too noisy, bulky, or hard to wear. For these patients, we offer oral appliances that resemble a sports mouth guard. At Almadensmiles, we have been highly successful at using oral appliances to treat patients suffering from mild to medium sleep apnea.